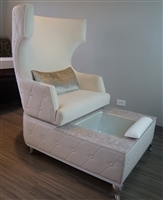 We create livable luxury with pedicure furniture and equipment by Michele Pelafas, Inc. - premium comfort & style for nail salons, spas and beauty salons. Michele Pelafas premium pedicure furniture for today's nail spa and salon offer hospitality style comfort and sophistication with state-of-the-art technology. We create and manufacture world-class pedicure furniture that is unsurpassed and offer standard and custom units to fit your unique space, style and budget. If you’re looking for modern, luxurious salon and spa pedicure furniture including pedicure chairs & pedicure benches, we have a selection that is perfect for you, with many premium options each designed by renowned interior designer Michele Pelafas. Our pedicure furniture is hand made in the USA and will give your space a one-of-a-kind feel and leave your customers feeling pampered and blissful. Your guests will come to you seeking relaxation and our pedicure furniture will allow them to unwind. Your guests deserve only the best, most comfortable and most luxurious pedicure furniture to keep them coming back time after time.